The 50-Person Trauma First Aid Kit is an extensive trauma first aid kit that factors into any facility’s emergency contingency planning. 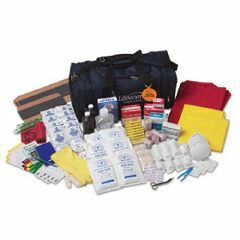 Major disaster response organizations designed this kit to meet the emergency medical needs of up to 50 people at a school, workplace, or other facility. The instructions and supplies in this kit can be used to provide first aid until qualified professional medical help arrives (many organizations offer expert first aid training for volunteers), and to assist professionals once they are on the scene. For compact storage and easy carrying, kit is packed in a large trauma duffel bag with double hand straps, adjustable shoulder strap, wide-mouth main compartment for easy access to supplies, and multiple pockets for easy organization. Bright orange tag identifies kit in an emergency. 24" x 11" x 11"
For additional help with search and rescue operations, purchase one Search and Rescue Team Kit (sold separately) for each volunteer search and rescue team in your facility. (6) elastic gauze bandages, 2"
(6) elastic gauze bandages, 4"
(1) roll adhesive tape, 1" x 10 yds. (2) rolls adhesive tape, 1⁄2" x 10 yds. Is it possible to get a list of everything included in the 50 person trauma first aid kit? I live in a community of seniors and we are trying to stock emergency equipment.